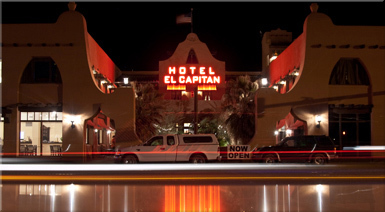 “The El Capitan has fifty-two rooms, twelve of which have French doors that open to private exterior balconies or patios overlooking a central Courtyard with a fountain centered in the midst of palm and olive trees. In the 1970’s, every bathroom in the building had been removed when the hotel was converted to a bank. With the new renovation, all rooms have been completely restored with private baths featuring black and white hexagon tile and Kohler fixtures. If you ask Duncan what was the most interesting aspect of rebuilding El Capitan, he says “finding the secret passageways of the building”. For security measures when the bank moved in, they closed the old passageways, several staircases, about 50 linear yards of underground tunnels and a small room. He says during renovations, they started pulling 1970’s paneling off the walls and found all sorts of passageways that nobody new anything about. The only artifacts found from the original hotel were some vintage monogrammed Hotel Capitan dishes and 1930’s beer cans. Judy and I were very tired after driving about 10 hours and over 500 miles. We were starting to believe that we would have to drive all the way to El Paso. The two “60 somethings” were again questioning our judgement… We could have stopped at Ft. Stockton, a dusty unwelcome town we stayed for one night on our trip east earlier. We saw all the lights when approaching Van Horn, TX and wondered if we would be lucky to find a “fleabag” motel, anything… But what we found was much more than another dusty town with few lights and hardly a soul or even a fuel station. 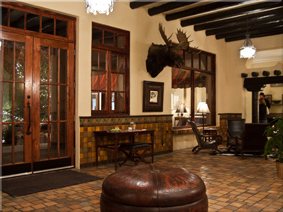 Van Horn is the hub for a big time recreation area in this part of Texas, approximately 120 miles east of El Paso. Taking a risk once in while is a good thing, and for the most part has produced pleasant surprises, like the Hotel El Capitan featured above. I was immediately re-energized and inspired to capture the whole story for my blog posting today, and think about our return trip at some point to explore the area more deservedly. I promised Judy to let her sleep in since we gain an hour just five miles west of Van Horn. Traveling through 500 plus miles of “no man’s land” was an adventure. I even put on my IT infrastructure hat, and observed all the work along the way to beef up broadband access and overall telecommunications service on Interstate 10. “Build and they will come” we used to say back in the day. I believe IT business planning today still includes this highly effective assumption to spend the billions needed to build fiber optics and continuous high speed Internet in a ubiquitous fashion as fast as possible. It will be a pleasant drive to the Tucson area today to spend Christmas with our dear friends from Leavenworth, Washington, Werner and Claudia. Winter time in Arizona has become a first choice option these days for many as compared to sticking it out in the long punishing winter of cold and deep snow back home in North Central Washington. Stay tuned to our travels while we return home to the Central Oregon coast. We fantasize that the rain and wind will end by the time we get there by mid-January. Slight chance is the reality! This entry was posted in Uncategorized on December 23, 2012 by stevesparks.